My mom was so excited to have me home this week. 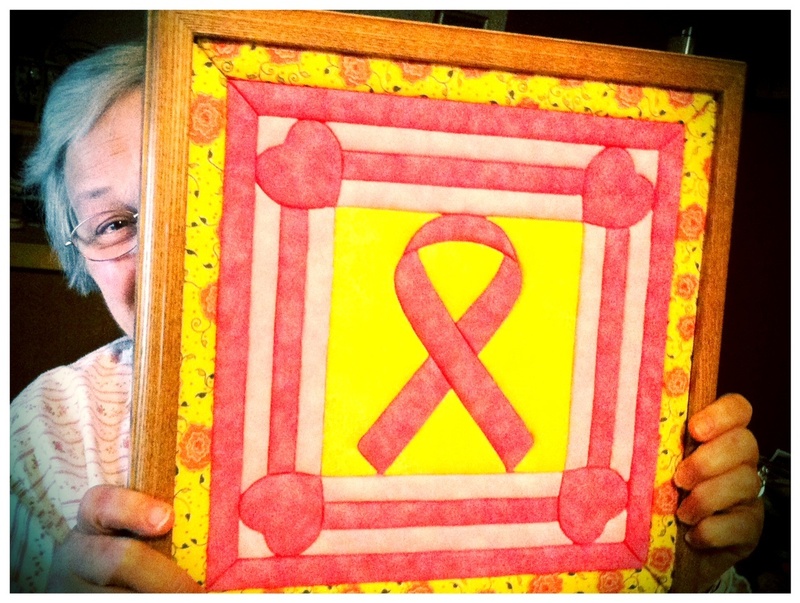 Mostly because she ordered this kit that sort of looks like a hand-quilted square that shows she’s a breast cancer survivor. A survivor she is; crafty she is not. The interesting thing about this kit was it’s a no-sew project. You cut out the pieces and sort of shove the material down into a foam piece. It’s pretty much easy enough for a child. But Mom didn’t want to do it. So this was my Wednesday night. Despite the hindrances (e.g. Mom’s lack of a decent pair of scissors, figuring out her ancient iron and realizing I needed to turn it waaaaaaaay down because it somehow almost melted cotton), Mom was able to cut the material and I stuffed it all together—all while she, The Owl and I watched Minute To Win It. And while I was home, I also dropped off my quilt at the place where I actually learned how to piece one of those monstrosities together, Quilters Delight, and will be able to pick up the fully quilted blanket in April so I can finish the binding and start using it. Stay tuned for a Bambino’s bedding and more baby-style goodies!